Second tenor Martin ‘Polly’ Perkins had a rapturous send-off from choir members at the Royal Standard pub on Saturday March 19. Martin was retiring after many decades as the Standard guvnor, having concluded that he had served enough pints by then for anyone’s good. Choir chair Kim Ormond presented Martin with a framed drawing of the Standard which was done by JWT. A sizeable contingent of the choir serenaded Martin to his rest with the tried and tested apres repertoire, led with gusto by Nev Clark and Banners Bannister. There were free drinks and food for choir members for a generous part of the evening. The mega-hot sausages and chicken were firm favourites. Pub regulars would not be drawn on how far they felt Martin had contributed to drunkenness and alcoholism in the central Croydon area. Martin has always emphasised the importance of responsible drinking and has done his best to set an example himself. 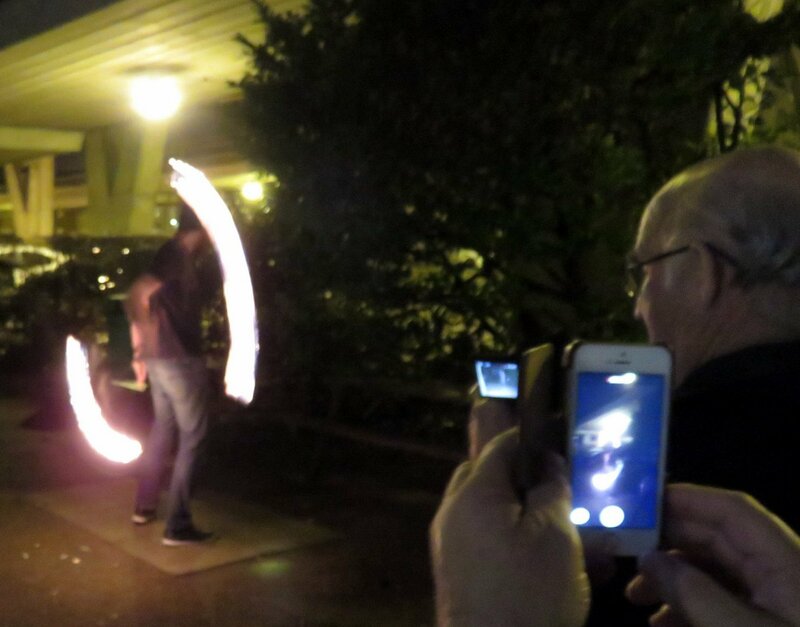 A highlight of the evening was the spectacular fire-stick display performed by the popular new Standard barman, Blake Gillman – a multi-talented young man who takes after his grandfather Peter Gillman. Stewart Robinson was awarded the CMVC Alan Robertshaw Shield at the choir's annual dinner on Saturday January 10. Baritone Stewart was honoured for his outstanding work as the choir's new concert organiser. Choir chair Kimball Ormond, who presented the shield, praised Stewart for his vital work in his new role. Kim added that Stewart may not have been fully aware of just how much work it entailed, but it was all the more impressive and valuable for that. Stewart said afterwards that he was both surprised and delighted to receive the shield. He added: "This is the most humble day of my life." The Alan Shield is awarded every year to choir members judged by the committee to have made an important contribution to the choir's activities. Last year's Alan shield winner was the choir's ebullient archivist, Vic Wallace. The award announcement was a highlight of another successful choir dinner at Shirley Golf Club. A key aim of the dinner - formerly known as Ladies Night - is to thank choir wives and partners for their endeavours in assisting and sustaining the choir and its members during the year. The diners also noted, with regret, the retirement of David Henderson, a popular top tenor and choir stalwart for many years. Dave is well-known for his work in support of the children's hospice charity, Demelza. He accepted a cheque for £460 from Kim at the dinner (see Home Page). The choir raised the funds through its singing and collecting at the Whitgift Centre before Christmas.